Observed few additions to JSR286 Web Content Viewer portlet as part of WP8 and seems following two features solves of some clients requirements easily. Creating placeholder content directly when we add content viewer portlet to page. a. 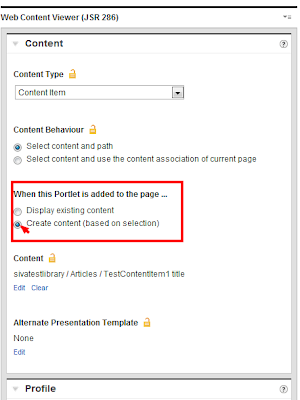 This feature is useful when you have requirement to allow the content authors to edit the content directly from the portal page using inline authoring tools . 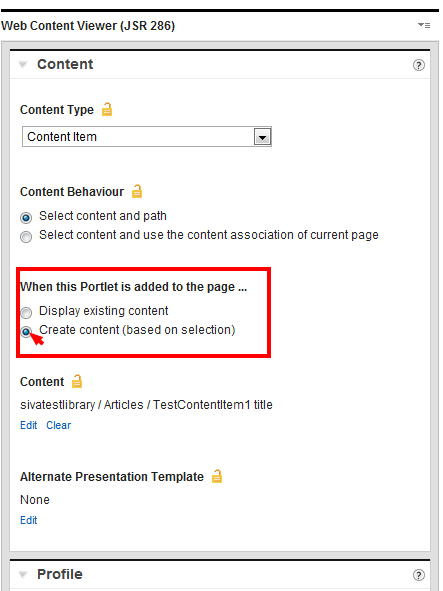 Once portal administrator creates the page and add configured clone of the content viewer portlet content authors can directly update the content from portal page. i. You can configure the portlet from the Administrationà portlet managementà click on configure icon on respective cloned content viewer portlet. ii. You can configure using the “configure” mode of the portlet after portlet placed on the page. iii. From XMLAccess interface you need to set the following preference : “com.ibm.portal.wcm.copy.contents “ to value “true”. d. Copied content is stored under the sitearea that is associated with page. If you place the multiple instances of the portlet then it creates the copies with names like “_1” , “_2” …etc.